Space Craft Manufacturing builds distinctive and quite large—up to 57' with three bedrooms—semi-custom luxury RV travel trailers. Elegantly appointed, the large interior spaces require a powerful heating system that delivers soothing comfort with whisper-quiet operation. That's why Space Craft offers hydronic heating solutions from market leader Aqua-Hot Heating Systems. Unlike noisy and dusty electric heaters, reliable Aqua-Hot hydronic solutions don't dry the air or leave cold spots. Instead, they provide gentle, even currents of warm air for exceptional comfort throughout the RV. Adaptable, they'll run on AC shore power, or propane or diesel, and deliver continuous, on-demand hot water. At 12" H x 19.2" W x 29.5" L, the Aqua-Hot 400D is quite compact, yet produces an astounding 56,000 Btu/h through its eight burners. Along with residential-style heating, the unit delivers continuous 110°–120° F hot water at 1.5 gallons per minute. 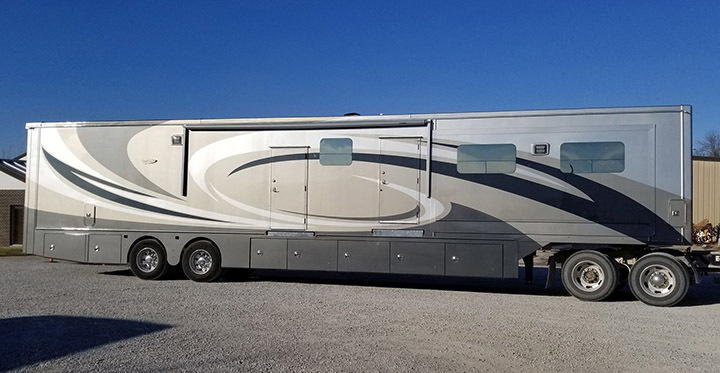 Since 1962, Concordia, Missouri-based Space Craft Manufacturing has been building semi-custom fifth wheel, bunk house, travel and living space trailers, as well as semi truck toter boxes. Its products are used extensively by the entertainment, and horse and auto racing industries, and for government purposes. Its website is www.spacecraftmfg.com.